House of musaak is owned by Chinwe Nwokocha (aka CNN) whose passion for music and raw talents drove her into the music industry to nurture raw talents.Four music artists are signed to House Of Musaak whose names are Blessing Chris AKA Lady Nyice the label first lady her vocal dexterity will sweep you off your fit. Phillip Ebuka Emmanuel AKA Oral P is an Hip Hop artist a native of Abia State, he love writing, reading,listening to beats and watching movies.Edike Chinedu Francis AKA Adeekay is an afro pop/raggea artist he is a native of Delta State in is word. He is the next big thing to happen to the music industry. Ashakah Andrew Afoh AKA Ashakah is Afro Pop/ Dance hall. He sings Music that cuts across all tribes & languages both local & international also a native of Delta State. 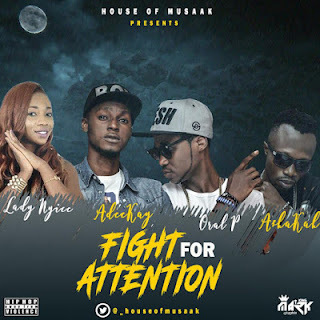 House of Musaak all stars releases this dope track titled FIGHT FOR ATTENTION, they are about to make a statement in the music industry with FIGHT FOR ATTENTION.